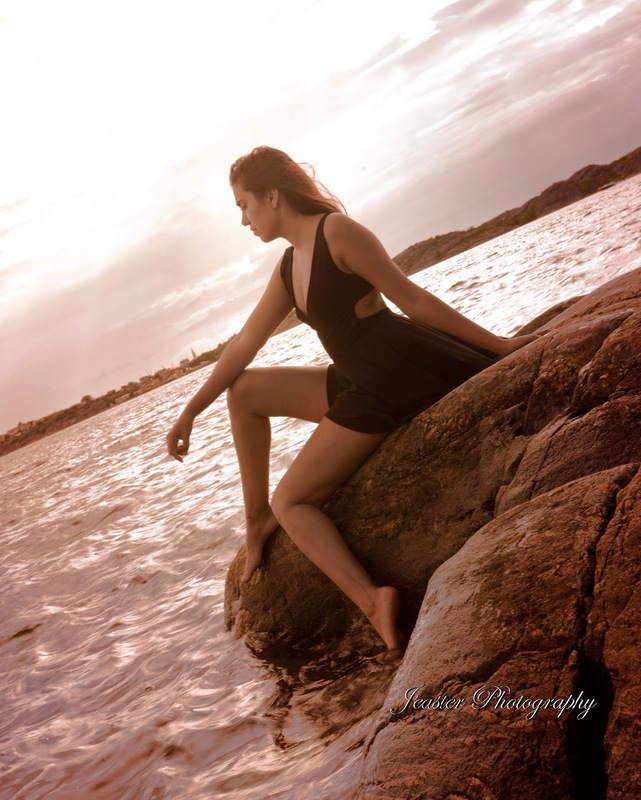 The west coast in Sweden is known for its dramatic sunsets and I love the feeling this pictures evokes. 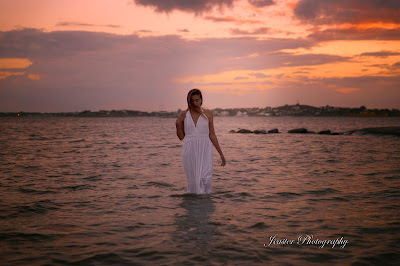 In my next blog post I'll explain more about my concept and thought process behind these kind of styled photo shoots. The model in these pictures is not a professional model in actual fact she is a first timer in being photographed in this style. 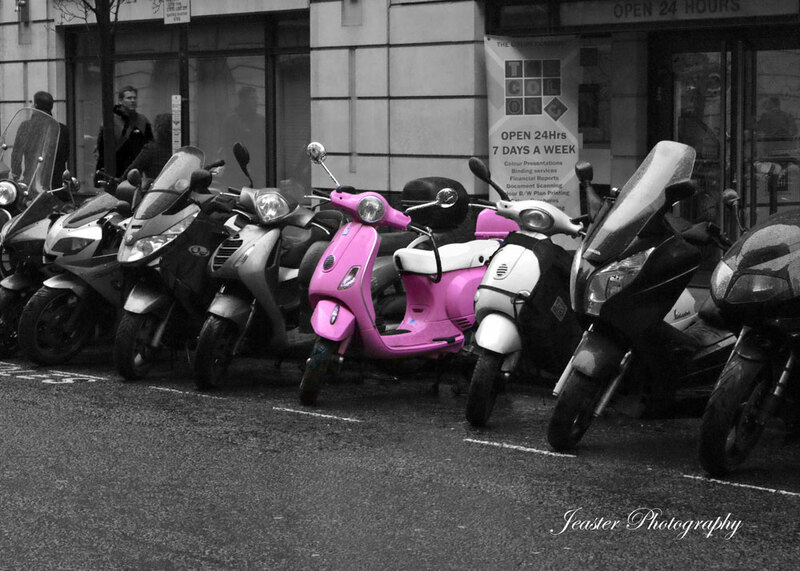 It was a rainy dull day in London, as I walked along Curzon Street in Mayfair, a row of motorcycles and scooters lined the side of the road. Colors ranged from grey to black to blue to various shades of green to cream and then pink. The little pink Vespa with the white saddle stood out, centered almost framed by the other bikes. The vibrant pink is all I saw, and the vibrant pink is all I wanted this picture to say. When you see the bond between elephants and how they rarely stand alone you see some thing special you see a unity between them, a peaceful understanding. 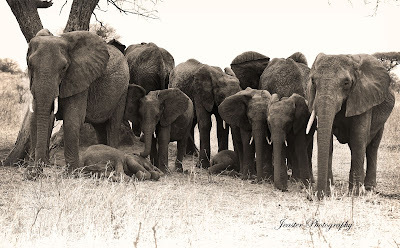 Under the trees in the shade from the midday’s heat stood a group of eight elephants motionless lying beneath them were an additional two who appeared to be the youngest. The whole scene expressed tranquility like so many of the other things I experienced in Tarangire, but this scene had a wholeness about it, a family feeling, a feeling that everybody belonged exactly where they were. The second day of the safari it was rolling on to late afternoon, when we spotted a congregation of safari trucks on the other side of the dried out Tarangire river. All spectators were fixated upon something that alluded us, with the convoy of vehicles on our left we came up on the bank of a river bend and that’s when it became clear what the great attraction was. 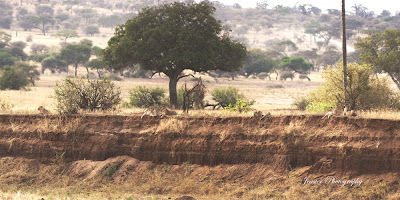 A herd of elephants ambled along the dried out river bed below us as magnificent as they were they were not the great attraction that had the crowd fixated upon. It was the nine spectators that watched the elephants that were the attraction, a pride of nine lions watched the procession below out of curiosity or other intentions I am uncertain, I know lions have been known to kill young elephants but such a daring feat requires great team work and strength of numbers which this pride had. So perfectly positioned where six lions all looking down toward the elephants on the river bed, the total view to wide for the lens I had I opted to take two images and stitch them in post processing. The tree was positioned perfectly along with the symmetry of the lions the one two one two sequence. What pleased me even more about this picture is the advantage point we had was unique from the convoy of safari vehicles on the other side of the river. 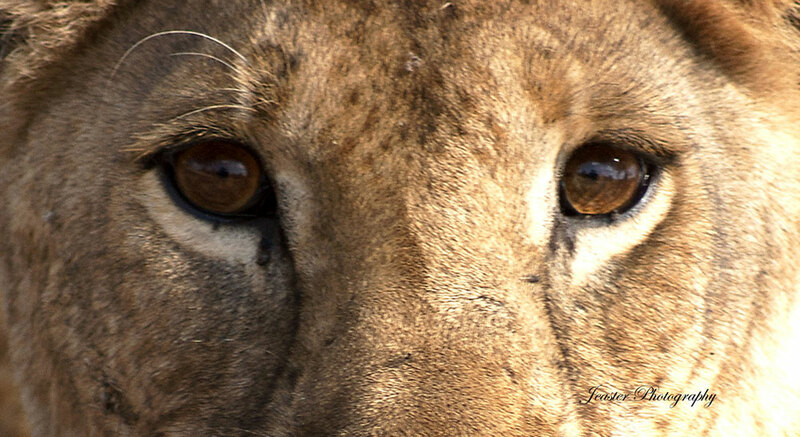 I once read there is nothing that compares to looking a lion in the eye and having them stare right back at you. It’s not until I experienced it did I understand how it felt, the intensity is electrifying how intimidating a big cat can make a human feel. 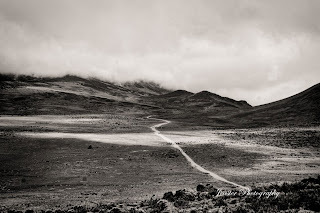 The journey from Arusha to Tarangire National Park takes about an hour and a half. The ugly single line of power pylons that stretches over and long the road and into the horizon destroys the picturesque scenery, the sight of these iron towers brings a realization of changing times and modernization. Through the fields Massai herds men attend their livestock gently ambling along, dressed in their customary red robes, bead jewelry and simple sandals. Scattered across the flat lands you see the Maassi homes (enkaji), thatched round mud huts along with rectangular shaped sheds that accommodate their animals all surrounded by twig fences. 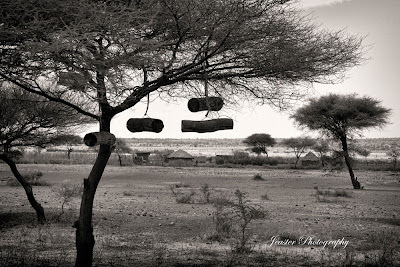 Traditional beehive logs hung from many a tree around the villages. Everything seems so peaceful so simple, traditions untouched, masasai doing what their fathers and fore fathers did before them. 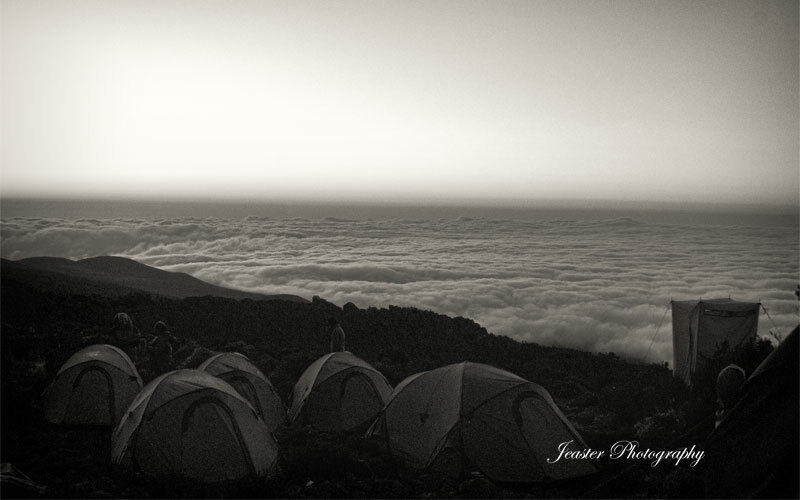 The final day, peering out of my tent I was greeted with a view that you don’t experience every day, a sea of clouds laid before me. 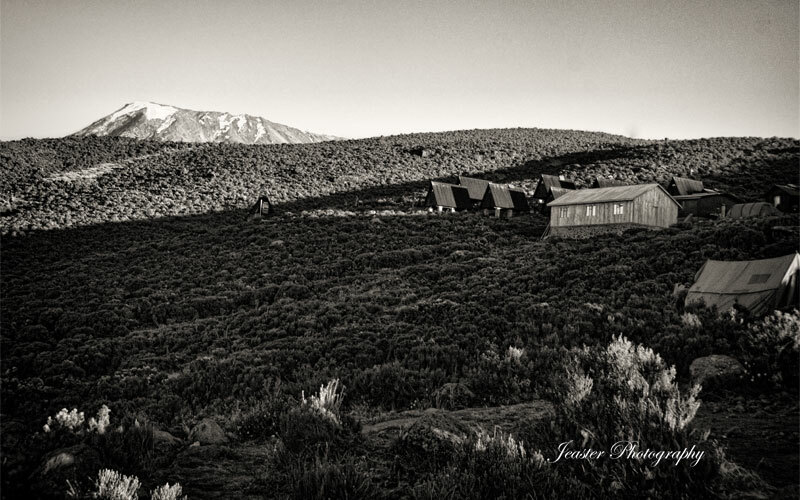 The morning was cold as I walked around the camp, after a short while the sun began to rise above clouds and fell across Kilimanjaro and Horombo Huts. The traditional farval ceremonial songs and dance was to take place after breakfast, this tradition is to mark the near conclusion of our journey. The atmosphere around the camp was relaxed I guess having the hardest days behind us was a good feeling, there was also a sense of sadness knowing our journey and our Kilimanjaro adventure was coming to an end. 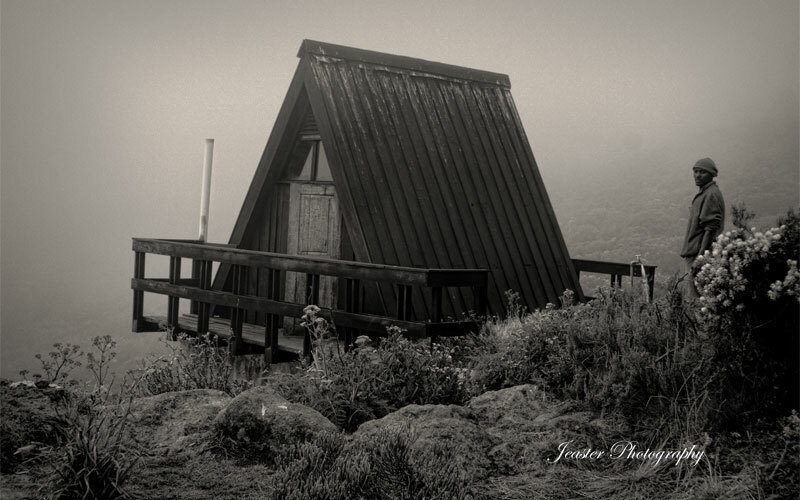 As we walked over the crest of the ridge the view over Horombo Huts was magnificent, from now the walk would be downward, this was the day that I get the shower I dreamed of, I have a feeling it will be the best shower I have ever had. 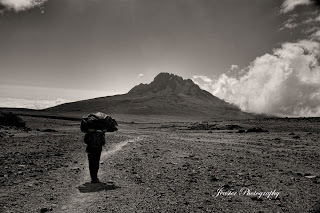 When I think about the six days that were spent on Kilimanjaro mountain and the days I thought the walk would never end, the faces I encountered and the conversations I had I have a feeling my story on Kilimanjaro has not found a conclusion, having not summated I guess it’s a feeling of un-finished business, so with that I will add my closing statement "To Be Continued". Looking at my watch it read four degrees it felt like it as well. Crawling out of the tent, the camp lacked the usual morning bustle. Six people from the group were still on the mountain, the morning was fresh however a lot warmer than it was six hours ago in the dark. The morning coffee was welcome, breakfast was hard to digest I lacked the appetite. Alfred would be leading us back across the saddle ahead of the group, there was little point in waiting for their return, they were going to be in need of sleep after their night hike. The camp was quieter than when we arrived the previous day, porters packing up camp sites preparing for their return journeys. Our walk began, porters passed us laidened with their heavy packs, they seemed to bear these with what appeared to be relative ease, I wondered so many times how often they had walked these paths they were so familiar with. 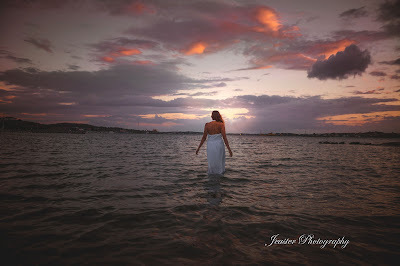 I looked back to the way we had come and saw a moment that I so wanted to capture. 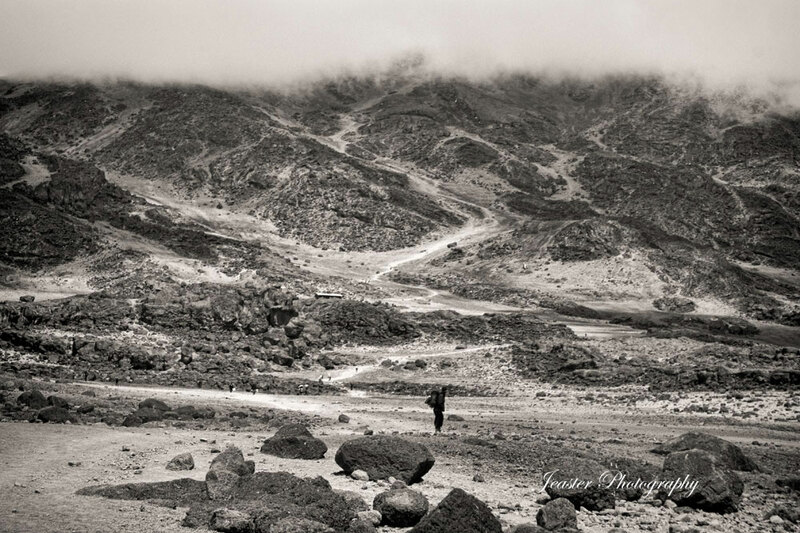 A guide stood along the path motionless, dressed in black with a mask covering his face protecting him from the elements, behind him was Kimbo base camp and above the clouds had covered the path that led up to the summit. Across the saddle the walk seemed never ending a different route to the one we took when we approached Kimbo the previous day, the sun was out and felt strong its warmth hidden by the breeze and moisture from the passing clouds. People passed us occasionally on the path towards Kimbo Huts, with the look of anticipation and the curiosity of what laid before them. 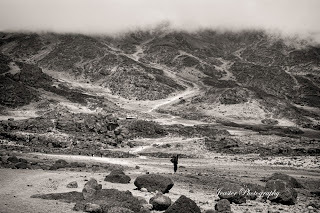 As we approached Horombo Huts, I felt consumed by exhaustion, the sight of this place lifted me somewhat knowing that the days walk was almost done. Sitting outside the registration hut were a number of larger huts, nothing spectacular to look at but that is not what caught my attention, outside the hut stood a man wearing shorts and a t-shirt with a towel around his neck he was drying his hair. I felt the pang of jealously, this guy had had what I had dreamed of having and was in desperate need of for the past two days "A Shower". 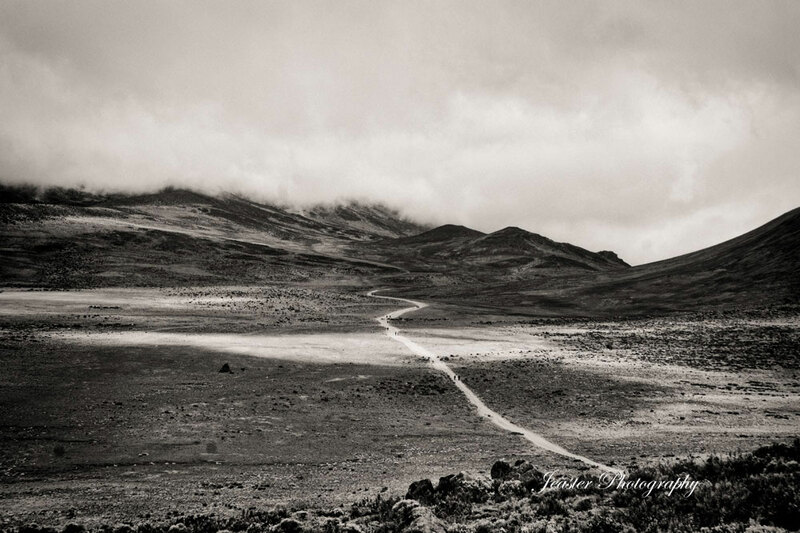 The clouds moved in so quickly, from being in the suns warmth to being surrounded in the damp coldness of clouds. 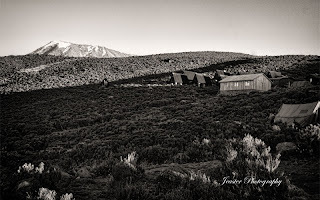 Horombo Huts was so much more civilized in comparison to what we had been used to, a real luxury, however our own simple living remained the same. That afternoon gave way for time to reflect upon the last twenty four hours. Through the years my style of photography developed and evolved and so did how I saw things through my lens, and that's where the love of color and story capturing began, I wanted my pictures to create questions for their audience, I wanted to evoke an emotional response, I did not want it to be just a picture you see. I want what lies before you to tell a story, evoke an emotional response, maybe a sense of familiarity of some where you once where or even somewhere you dream of being. Something as simple as a smile, look beyond and you might be surprised as to what you may find. Jeaster Photography. Awesome Inc. theme. Powered by Blogger.